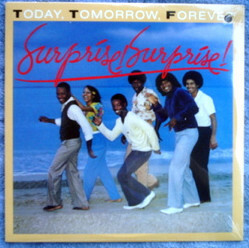 Gold Coast ST 71.000 vinyl LP (1981) TTF Today, Tomorrow, Forever Surprise! Surprise! Mighty Fine/If the World Could Love/Let Yourself Go/Surprise! Surprise!//Love Is Just What You Make It/Got To Keep Movin' On/Thank You, My Love/Dance, Party, Jam Original--not a reissue. Still sealed. Hole punch and slight creasing in upper right corner of cover.